Jeff Pedowitz, CEO of The Pedowitz Group, sits down with Nnamdi Nwoke, Head of Demand Generation at GreenSky. They discuss the role of the everyday marketer and the impact we have on human lives, the importance of empathy and the necessity of mentoring when growing your marketing team. Nnamdi Nwoke is a transformational marketing leader with deep Customer Journey, Martech, Data Analytics/Insights, and Revenue Strategy experience. He is currently the Head of Demand Generation at GreenSky. Nnamdi began his career in email and marketing automation at Silverpop, and he has worked as a senior marketing strategist with b2b technology enterprises such as SAP Ariba and Marketo. He also advises Fortune 1000 CMOs on digital media and marketing. Born and raised near Washington DC, Nnamdi received a PMBA from GSU’s J. Mack Robinson College of Business and a BA in Communication from the University of Maryland. His work has been featured on BET, VH1, in Atlanta Magazine and Success From Home Magazine. In this episode of CMO Insights, Tiffany Sieve with Paycor expounds on their journey and transformation to becoming Revenue Marketers, integrating their marketing strategy with new technology. 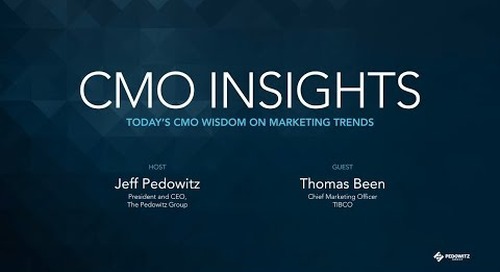 In this episode of CMO Insights, Jeff and Thomas Been, CMO of TIBCO, discuss providing a leading platform for digital businesses, marketing becoming more accountable in business and digital marketing. Jeff and Gaidar Magdanurov, CMO of Acronis discuss the complexities of being a marketer, how AI will change the role of marketer, and looking at the customer experience from the customer perspective. Jeff sits down with Megan Lueders, CMO of Zenoss. They talk about honing the marketing approach and ABM, aligning Sales and Marketing, fostering a culture of performance management and much more. In this episode of CMO Insights, Jeff interviews Peter Smails, CMO of Imanis Data. They discuss how the cloud has changed data, driving awareness in the market and leveraging Marketo and Salesforce. Today's guest on CMO Insights is Mark Floisand, CMO at Coveo. He discusses being personal, authentic and transparent in marketing, unifying data for the customer journey, and trust with customers. In this episode, Jeff interviews Mike Westgate of Briggo. Mike talks about the global experience of coffee and Briggo's connected coffee experience, driving growth and leveraging location-based data. Jeff Pedowitz interviews Dana Poleg of Kaltura. They discuss changes to marketing in the last 5 years, MarTech, and building an effective marketing machine with a small team. In this episode of CMO Insights, Tifenn Dano Kwan, CMO of SAP Ariba, discusses her journey upwards through marketing to the role of CMO as well as how her experience has shaped her marketing team. In this episode, Jeff sits down with Melanie Huet, VP of Marketing with the KraftHeinz Corporation and discuss brand and media innovation in a time when customers are using multiple screens and more. In this episode, Ron McMurtrie with Sage, expounds on the challenges of 28 markets and more than 3 million customers in a global organization and discusses unifying MarTech stacks. In this episode, Jeff speaks with Katrina Wong, VP of Marketing of Hired. Katrina talks about the importance of emotional connections with audiences and technology helping to prove marketing’s value. On this episode of CMO Insights, Jeff Pedowitz sits down with Scott Horn, CMO of 7.ai. Scott talks about how AI is revolutionizing transactions. He also discusses ABM and content marketing. CMO Insights: James Thomas, CMO of Solium Capital Inc.
Jeff sits down with James Thomas, CMO of Solium Capital Inc.. They talk about equity management software and how Solium Capital's platform solves problems for both small and large companies. 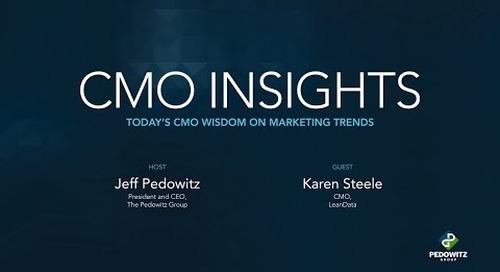 In this episode of CMO Insights, Jeff interviews Lisa Cole, Corporate VP and CMO of Huron. Lisa talks about what it's like to move from consulting to the client side. 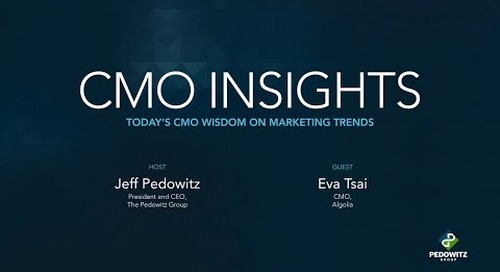 Industry icon and veteran Eva Tsai, CMO at Algolia, chats with Jeff Pedowitz, President and CEO of the Pedowitz Group about her journey from engineering to marketing and machine learning and AI.